POTEAU (KFSM) - A season ago, Poteau saw their dream come to a halt in the first round of playoffs, where they took Wagoner all the way to overtime before getting eliminated. "I'd say that game makes everybody mad - about how it went down. We definitely should've beat them," senior quarterback Jett Pitchford remembered. "We should've ended their streak. Things just didn't happen how it should have." However, a loss didn't stop the Pirates from persevering and working even harder in the offseason. "I think the way the kids came out and they picked up where they left off in the spring," head coach Forrest Mazey explained. "The speed at which we practice - the effort's good, and they're picking stuff up a lot better than two years ago." Now, the Pirates return seven starters on each side, and the experience is already proving to pay off in practices. "We're really really fast and we're really strong this year, so I'm excited to see how we're going to do in our secondaries," senior defensive end Gunnar Thompson said. "Everybody's back and I feel like we're going to step up and eliminate the big play this year." "I think we have a really good chance this year of going all the way," Pitchford added. "We were pretty young last year, we had a few back. This year we have a lot back. We have a lot of seniors." Returners mean a lot less growing pains, which in turn allows the players to focus more on the ultimate goal. "I just feel like we're ready. Defense looks great, offense is looking great. Everything's coming together smoothly," Pitchford said. "We're moving fast through it. Our plays are coming in hot - just smooth. Everything's just smooth this year." "Some things that I've noticed is that we're just all really close and that makes for a really good team," Thompson added. "It's more than just football - it's a family here, and that's what makes it really really good." With knowledge on the field and a hunger to prove themselves, Poteau has their sights set high on a successful season. "They want to compete for a Gold Ball. There's no question about that," Coach Mazey said. "It's are they willing to do each day what it takes. We're going to nitpick and do some things that other teams may be proud of, we may nit pick a little bit." For now, the Pirates are dedicated to giving their all every practice before the Friday night lights turn on and the stands fill up. "They can expect a lot of energy out here on the field," Thompson said. "We're going to bring the juice every day and it's going to be something special." "You just gotta stay on the grind. Every day," Pitchford added. "You can't take any plays off, any snaps off, you can't. You gotta give 110%. Every play." All in hopes to see themselves holding up a trophy at the end of the season. 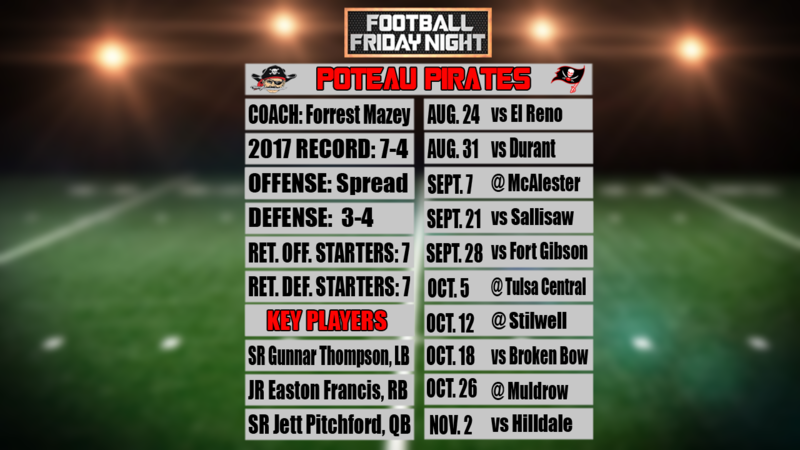 Poteau opens their season August 24th with a home game against El Reno.